Each week the Noise highlights 12-13 somewhat obscure, unobvious names who he believes are destined to torch the competition. To qualify, each player must be started in fewer than 60 percent of Yahoo! leagues. Speaking as an accountability advocate, I will post the results, whether genius or moronic, the following week using the scoring system shown here. If you're a member of TEAM HUEVOS, post your Week 7 Flames in the comments section below. For whatever reason, the fantasy community must feel Palmer carries a contagion. Despite eclipsing 20 fantasy points in three of his past four games, most continue to keep the signal caller at arm's length. However, this week, because of bye week hell, fanatics need to trust his services. Palmer pinned last week's giveaway in Atlanta on himself blaming his poor ball security and mental missteps for the loss. Back in the Black Hole, look for him to kiss and make-up with the Raiders faithful. Defensively, the Jaguars are the new Hello Kitties of the NFL. Pounded via ground and air, they are an overly generous defense. Over the past three weeks, Andrew Luck, Andy Dalton and Jay Cutler each threw for at least 244 yards and two touchdowns against them. On the season, corners Rashean Mathis and Aaron Ross have allowed a QB rating of 106.2. 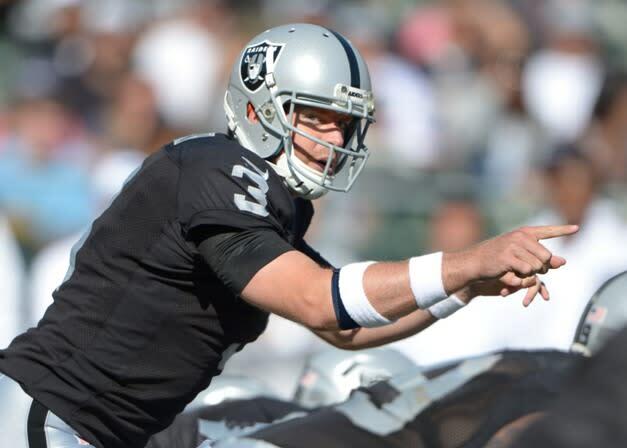 Due to Darren McFadden's ongoing inconsistencies and with Denarius Moore blossoming, Palmer will be leaned on Sunday. Bank on the man in black. It's true Jones would likely shred a ligament reading a book. The delicate back, who the Noise pimped heavily preseason last year, excels at disappointment. But with DeMarco Murray out of action for the foreseeable future due to ligament damage in his foot, the once overhyped commodity has a chance at redemption. Don't expect him to spoil his second chance. Considering its gross inadequacies defending the run, a mortally wounded walrus would likely drag its way to 100-yards and a touchdown against Carolina. This season, the Panthers have routinely received failing grades on gap assignments. On the year, they've surrendered 4.8 yards per carry 123 rushing yards per game and the most receiving yards to RBs. In relief of Murray, Jones looked spectacular last week in Baltimore. He attacked the line, forced missed tackles and was quick around the edge, a far cry from the out of shape rusher who failed a conditioning test in training camp. On 19 touches he totaled 105 yards, 55 of which were after contact. Yes, Phillip Tanner will wrest away roughly 10-12 touches, but if the Dallas offensive line can dominate the line of scrimmage again and Jones can stave off the injury imp, he's in line to post top-12 numbers in Week 7. Start him with confidence. Though Doug Martin is the clear-cut No. 1 by the Bay, there's a puff or three still left in Blount. No longer in need of car service, the "Lazy" rusher purchased an alarm clock, has shown up to team meetings on time and has put in the work, earning the respect of Greg Schiano and his teammates. As a result his snap count has steadily risen over the past three weeks climbing from 6-to-12-to-18. His seven carries for 58 yards and a score in a blowout win against Kansas City in Week 6 was his finest fantasy performance since Week 14 last year. In the encore, don't be surprised if he totes the rock 10-plus times for the first time in 2012. Unsurprisingly, the Saints are rather 'hole-y' on defense, particularly up the middle. In five games, they've yielded 5.0 yards per carry, 141.2 rushing yards per game and six end-zone plunges to RBs, equal to the most fantasy points allowed. In order to control clock and keep Drew Brees on the sidelines for as long as possible, look for Schiano to feature a power run game with Martin and Blount. If the much improved Tampa defense, especially the secondary, can rise to the challenge and keep the game competitive, the backup is in line for a top-24 day. FLEX him in 12-team and deeper leagues. Don't call him 'Debbie.' Filling the void for injured starter Danny Amendola, Gibson stepped up last week in Miami catching seven passes (on nine targets) for a career-best 91 yards, including a one-handed Madden-esque grab. At times over his four-year tenure in the league, he's shown flashes of star potential, but misroutes and a lack of chemistry with Sam Bradford made him wildly erratic. But it appears he's learned form the mental mistakes, realizing the personal opportunity currently at stake. Green Bay, uneven defensively over the first few weeks of the season, was dynamite in coverage last week, vexing Matt Schaub on numerous occasions. Still, evident against Indianapolis a couple weeks ago, the Packers secondary can be exploited. Though it's unlikely Bradford will channel the football ghost of Kurt Warner, he will likely be pressed into a high volume situation, enhancing Gibson's scoring potential. In a performance worthy of a Garbage All-Star nom, the wideout could clean-up late. Employ him as a WR3 in 12-team and deeper PPR leagues. For the sake of his queasy supporters, Britt better cover his gloves in reversible tape. Though his final stat line was commendable last week versus Pittsburgh (4-62-1), the wideout didn't make it look easy, plagued by a case of the bobbles. Mike Munchak blamed Britt's skittishness on the receiver's missed practice time and learning curve with the club's revised playbook. But the health of his surgically repaired knee is no longer a concern. If he can master the offense quickly, he should produce steady yields moving forward, starting this week versus Buffalo He's simply too talented not to. "Unkind" best describes how opponents have treated the Bills this year. Nine wide receivers have scored at least 10 fantasy points against them. Combined Stephon Gilmore and Aaron Williams have allowed 16.0 yards per catch. Because of Britt's big-play ability, look for Matt Hasselbeck to target him early and often downfield, en route to his finest effort yet this season. Weeden, who fought alongside Zach Taylor during the Mexican-American War, may be ancient for a rookie, but he's shown plenty of piss and vinegar over the past five weeks. During that stretch he's totaled at least 231 passing yards in each game and tallied a respectable 7:6 TD:INT split. At times he's been overly reckless, but forging a strong relationship with home run hitter Josh Gordon of late, Weeden has connected on a number of explosive pass plays. And according to the Cleveland Plain Dealer's very scientific study of each of his throws against Cincinnati, the passer is coming off his finest performance to date. Teams have battered Indy most often between the tackles, but they've also registered a great deal of vertical success. Four quarterbacks have found the end-zone twice in a game versus the Colts this year. Count on Weeden becoming the fifth. Keep in mind if Trent Richardson sits, Pat Shurmur may install a more air-minded game-plan. Better yet, the Browns' wayward defense could turn this contest into a shootout. Each week one fortunate guest prognosticator will have a chance to silence the Noise. Following the rules stated above, participants are asked to submit their "Flames" (1 QB, 2 RBs, 2 WRs, 1 TE, 1 D/ST) by midnight PT Mondays via Twitter @YahooNoise. How large are your stones?